So you want to learn about golden hour, huh? It’s a pretty popular time of day for photographers to shoot. I'll tell you what it is and why I like to shoot at that time of day! I have heard clients ask, "Can we shoot at 1:00pm?" While I will shoot mid-day as a last resort, it is not an ideal time. Most people don't understand why, and I thought I would shed some light on it (pun intended). Unless there is quite a bit of cloud cover or shady areas, shooting in the middle of the day under direct sun is difficult. Harsh shadows, squinting eyes and the bright sun is not my idea of a great photo. Yes, it can be done, and has been. I use back lighting a lot and my reflector/diffuser, along with finding hidden shade. Here is an old photo that I shot in direct sunlight. Jasmine's face is quite orange, she's squinting and she has such an uneven skin tone. This was one of my first senior sessions. Even back then, I knew this wasn't a look I was going for. Don't get me wrong, this session has always been one of my favorites, and there were plenty of great images. But it just wasn't the ideal time of day. I then moved to mid-mornings, which was a bit better. The lighting was nice, but mid-morning seemed to give off a lot of harsh shadows and dark faces. I did a lot of post-processing in Lightroom. But then I discovered what all photographers rave about. "The Golden Hour". This is the time just before sunrise or sunset. You may or may not have noticed that my first availability is always 1-2 hours before sunset. During this time, the lighting is absolutely perfect! It is also shortly after sunrise; however, not everyone wants to wake up that early, especially soon-to-be seniors in high school! You get yummy light flares and beautiful soft light. There are no soft shadows or squinty eyes from the blinding sun at high noon. In the summer, it cools off in the early evening, so you’re able to relax a little better knowing there isn’t sweat running down your face or making stains on your shirt. During "Golden Hour", everything is warm and pretty and gives off a magical feeling. We can also get some sweet silhouette shots as the sun is going down on the horizon. 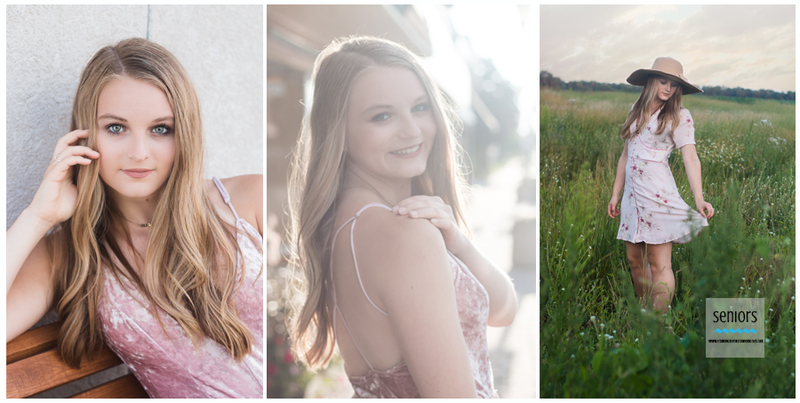 Here are some of my favorite recent sessions that I have shot during this time. I think you can agree with me that nothing compares, and that "Golden Hour" never disappoints! We can't forget the boys during Golden Hour! Here are a couple from my latest session, that was just amazing!